Heat Recovery Ventilators: Fresh air in and stale, polluted air out. Do odors hang around in your home for days? Aromatic reminders of your fish fry 2 nights ago? This is an indicator that your home may have poor ventilation, which means higher levels of indoor air pollution. One way to combat this serious health issue is installation of a Heat recovery ventilator (HRV) or an Energy recovery ventilator (ERV). HRV's and ERV's are controlled ventilation systems, not to be confused with bath fans or kitchen vents. Bath and kitchen exhaust fans are spot ventilation, controlled by the flip of a switch, when an occupant notices the need. These spot ventilator's purpose is to expel odors and humidity to the outside, for obvious reasons. A Heat recovery ventilator can provide fresh air for the entire living space. Fresh air supply is mechanically drawn from outside and disbursed throughout your home. Stale air, excess moisture, airborne chemicals and other particulates, and carbon dioxide are expelled out of the residence. 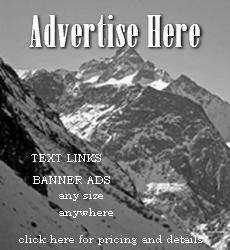 Introducing fresh outside air into your home, without losing precious dollars spent on heating your home, is a challenging proposition. That is where the Heat recovery ventilator wins it's medals. Many Heat recovery ventilator manufacturers boast 78% and higher efficiencies in heat recovery. For colder climates, an HRV is the ticket! For high humidity areas, an ERV is the better choice. An ERV is not recommended for areas which temperatures can drop to 25 degrees or lower during the winter months. 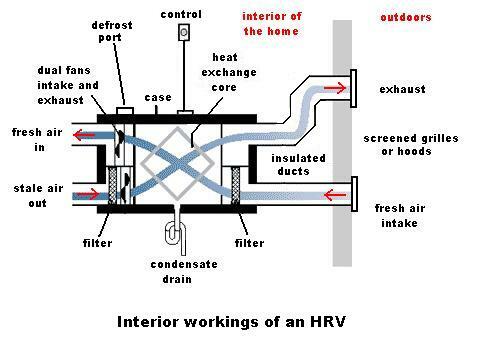 Both an HRV and ERV can be tied into the return air ducting of your forced air system. They can also be installed as a fully dedicated system for whole house, or for one area of your home where increased ventilation is neede, such as a home theater. This configuration requires that both the supply outlets and the stale air intakes be ducted to select areas of your residence. Control of your HRV or ERV can be as simple as a wall-mounted timer, which an occupant turns on as need arises. The other control option, and probably more desirable, is a wall-mounted dehumidistat. The dehumidistat will sense a high humidity level and will automatically cycle the unit on and off, depending upon the preferred humidity level you have set. It is recommended that home ventilation systems provide .35 air changes per hour. Residential HRV's usually range in capacities of 150 cfm (cubic feet per minute) and 200 cfm. To evaluate your home's needs, figure up the volume (cubic feet) of space in your home. Floor space (square feet) multiplied by ceiling height will give you the cubic feet (volume) of your home. Now, the HRV operating capacity (cubic feet per minute) multiplied by 60 minutes will give you the volume of indoor air replaced per hour. 3000 sq. ft. home x 8' ceilings = 24,000 cu. ft.
200 cfm x 60 minutes = 12,000 cu. ft. per hour. In this example, our 200 cfm unit would take 2 hours to provide 1 full air change or .5 air changes per hour. It certainly meets the needs of our example home, if the unit runs continuously.